Wondering how to make you app more visible in the app store? Challenges can be many when creating a new app. From branding, to designing the user interface to coding, there are many hurdles to jump. After the app’s launch is complete, user aquisition becomes a main focus. That’s where app store optimization can come in handy… if you know what to do. App Store Optimization (ASO) is the method of optimizing mobile apps to achieve a higher level in the app store top charts and search results. Because of its similarities to SEO of the Search Engine Optimization for websites, ASO is also referred to as App Store SEO, App Search Optimization, and Mobile App SEO. By making use of this these App Store Optimization tips, your app could level up your rank, you can be seen by more people, and receive more downloads. Here are ten essential steps you’ll want to take to improve your ASO in both the Apple App Store and Google Play. An efficient ASO plan begins with thinking like your customer and knowing the competitive terrain. Advance your app store discoverability by knowing which keywords could drive traffic. Choose a language focused on your targeted user. Why would someone want to download the app? Research the keywords used by your competitors, or like-minded apps. What are other search terms that may lead a potential user to the app? The best app names should be unique and keyword-rich. According to research, of the top 25 ranking apps, those with relevant keywords in their names ranked 10.3% higher than those without. The titles in the app store can be up to 255 characters, that includes spaces. Longer titles are trimmed on the search results page. Since keyword visibility leads to downloads, you should place keywords before the cut-off. In the Apple App Store, titles are trimmed after 23 characters. In Google Play, titles are cut when the charaters reached 30. There are lots of room for keywords so long as your app’s name is short and gentle. Google Play and the Apple App Store take very diverse approaches to ASO keywords. In the App Store, there’s a 100-character keyword field. There are only 100 characters that are a consideration for the app’s ranking. Use them wisely! Working more like modern SEO, Google Play assesses your keyword ranking from a 4,000-word customer-facing app description. Since this is what your customers read, it must be written for readability rather than for the algorithm. Research found that five is the optimal number of times to repeat a keyword in the Google Play product page. Any additional uses have no effect. For excellent results, make your app description a contextual and enticing part of your messaging strategy. Unless you want to risk turning off potential customers. What does the app do? How does it improve the users quality of life? Compel the reader to take a chance and download the app. Convince shoppers that your app provides a solution to their problem by describing the app’s entitlements. The Apple App Store and Google Play have different requirements for rendering app icons. For iOS, your icon should be sized to 1024×1024 pixels. However, Apple iOS will resize your icon, making it as small as 66×66 pixels for navigation icons. For Android, Google Play requires that the icon be 512×512 pixels. Design (or rearrange) your app icon simply, so that it looks good small. Similar to icons, screenshots and videos don’t impact search rankings – but they do drive downloads. According to app testing service StoreMaven, 60% of browsers won’t scroll past your ‘First Impression’. The ‘First Impression’ is the initial viewing screen people see after clicking your app link. Images will help liven the descriptive text and immediately convey what your app does. Creating an English-only app means missing out on global revenue. As research from app optimization firm Distimo shows, only 31% of app revenue is generated in North America. Asia drove 41% of all app revenue and 23% came from Europe. To drive revenue from global markets, tweak your ASO strategy to appeal to different countries. When targeting non-English speakers, you’ll need to translate your app title, description, keywords and screenshots to the language of other user segments, as Spotify did in Japan. Doing this will increase both the discovery and adoption of your app. 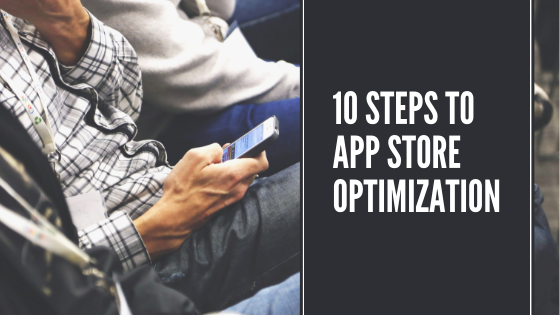 App store optimization is just one element of your overall app marketing strategy. Much like SEO, app store page views and backlinks from outside sources affect your search and app store page rankings. Developing your app with search ads allows you to bring potential users directly to your product page. Google found that of all online ad types, search ads drove 50% of all app downloads. App indexing also helps with re-engagement, as users who’ve already installed the app will be directed back to the app itself. A stream of validation from users is critical to boosting downloads and app store rankings. According to research by SEO company Moz, the higher the number of positive reviews in the app store, the higher the number of downloads. When indicating rank, the actual rating itself took a backseat to rating volume. Large fan communities are valued higher than five-star reviews. To gain a large user base, proactively engage and solicit feedback from your users. Prompt users to leave reviews, and remember that those on either end of the spectrum will be your vocal minority. Addressing these recommendations will give users a reason to give positive reviews. Mobile customers want apps that are developing with an acknowledgment to their needs. Updating your app frequently shows that you value your customers and a high-quality user experience. You’ll receive more favorable reviews by releasing a new and improved version of your app that garners happy feedback. You can as well update the app description in the “What’s New” section of the app store. Writing a persuasive message in that section will help you secure downloads. Have a great idea and don’t know what to do next? Call us at 832-683-1527.